Dream Pod 9: Valentines Day Gift: Jovian Wars Venus Faction Alpha Playtest V1.0 PDF Now Available! As promised its Valentines Day and Dream Pod 9 has a gift for all our Jovian Wars fans. The Jovian Wars: Venus Faction Alpha Playtest V1.0 PDF with datacards for the all the Venus exo-armor/fighter squads and spaceships is now available to download on DriveThruRPG as part of the free Jovian Wars: Beta Rules. If you had previously download the Jovian Wars Beta Rules, you should have just received an email from DriveThruRPG announcing the new Venus Faction Alpha Playtest file available for download, if not here is direct link to the page to download it and the Beta Rules now. Please join us in playtesting the new Venus Faction spaceships, exo-armors, and fighter squads. We'll be launching a new Jovian Wars Rules Committee later this week, similar to the one we launched for Heavy Gear Blitz last week. We want to increase interaction between Dream Pod 9 and Players, so we can get more feedback on what players like and don't like in the Jovian Wars rules and playtesting of the new Venus Faction. We also have some of the Venus exo-armor and fighter squads already available for purchase on the Dream Pod 9 Online Store at the following link, the new spaceships, exo-armor and bomber squad with be parts of a Venus Faction Kickstarter planned for Summer 2018. We wish you all a Happy Valentines Day! 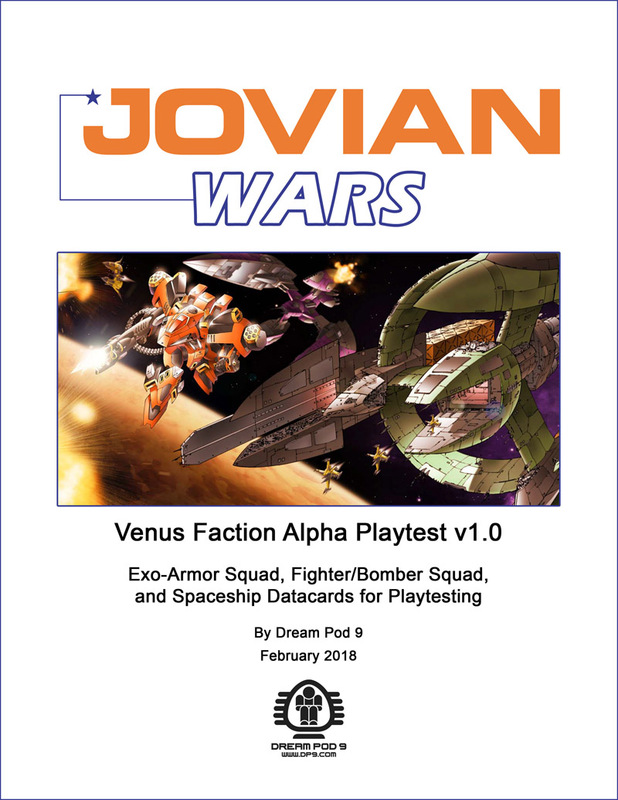 Home › Blogs › Robert Dubois's blog › Valentines Day Gift: Jovian Wars Venus Faction Alpha Playtest V1.0 PDF Now Available!